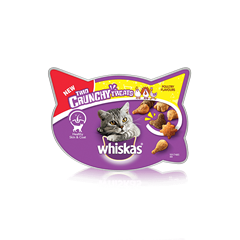 She will adore WHISKAS® Trio Crunchy Treats as they deliver plenty of variety with a medley of delicious flavours, fun shapes and exciting colours. WHISKAS ® Trio Crunchy Treats Mixed Grill Flavours is rated 4.8 out of 5 by 106. Rated 5 out of 5 by Catherine23 from My cat has had these many times and always knows when I shake the packet. Loves them. 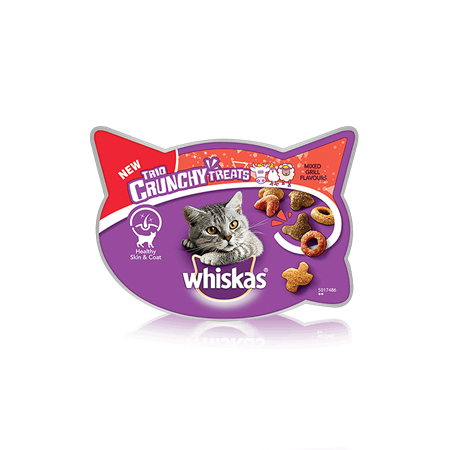 Rated 5 out of 5 by Pusscat from Great treat My cats all loved these treats, quite a lot in the tub so plenty for them all to try, really like the different shapes. Have to make sure i put pack in a cupboard otherwise they would be helping themselves to the rest of the tub. Cereals, Derivatives Of Vegetable Origin, Meat And Animal Derivatives (Including 1% Beef, 1% Lamb, 16% Chciken), Vegetable Protein Extracts, Oils And Fats, Minerals, Yeasts. WHISKAS® Trio Crunchy Treats® with Beef, Chicken & Lamb are formulated to meet the nutritional levels established by the AAFCO Cat Food Nutrient Profiles for adult maintenance. WHISKAS recommends feeding across all food formats by giving your cat 2/3 of her daily calories from wet food and 1/3 from dry – don’t forget to treat your cat too!